Shakespeare for Everybody can be geared to actors of any level, but is ideal for experienced actors who are new to Shakespeare, or struggling with his text. The goal is to naturalize text that too often lends itself to a stilted, declamatory delivery, while at the same time respecting its technical demands. The basics of mining classical text for clues to character, intention, mood, and tone will be combined with work on actions and intentions, as well as exercises to develop physical presence on stage. Ashley’s approach to Shakespeare is based on the primacy of story. An actor who seems emotionally connected, but is difficult to understand, an actor whose words are clear, but whose heart is opaque, an actor who acts from the neck up, an actor who does not vary his choices; these are all symptoms of the same disease: not telling the story, and not using all the tools in the text and within ourselves that we have been given to do so. Each student will gain confidence speaking and performing publicly, discover what’s funny about themself, learn how to write set-ups and punchlines, and how to deliver jokes. The ultimate goal of the class is for each student to craft and hone their best seven minute set. At the end of term, the class will participate in a live comedy show. In the Wilmington, NC area the show will usually be at Dead Crow Comedy, Wilmington's own professional comedy club. Ashley is also available on the Sun Coast of FL Jan-Mar, and is available for travel throughout the year, given proper consideration. 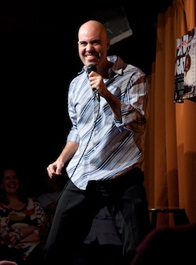 Private coaching is generally reserved for experienced comedians. For beginners, much can be learned from classmates. Private coaching is for comics who are regularly performing. The goal of coaching is to provide the comic with tools that might take years of performing to discover and implement. There is no substitute for repetitions, but good repetitions will accelerate your progress; bad repetitions will keep you stuck. Coaching will make your process more efficient. Though I don't mind working on new material, we will begin working on material that is already prepared. Often comics will find that even strong jokes that are among their most reliable material are improved by this work. From a writing perspective, we will focus on tightening and punching up. From a performance perspective, we will focus on act-outs, landing punchlines, listening, and making clear how you feel about what you're saying. I am available for Skype sessions, FaceTime, or Google Hangouts.